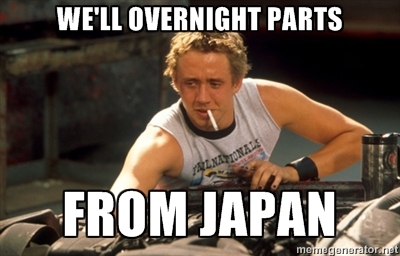 It’s well known that if you own a Japanese vehicle, the odds are good that there are aftermarket parts or factory options we don’t get on American shores. Being a JDM fanatic, it helps to be able to order things from Japan every now and then. The first service I use is Tenso. This service gives you a personal mailing address in Japan which will let you order from just about anywhere that doesn’t usually ship internationally. I use Amazon.co.jp mostly but have ordered from Rakuten as well. One your package arrives at Tenso, you’ll get an email alerting you, and from there you select your shipping method and pay for it. You have to be careful, I once ordered a bicycle only to discover that the shipping would have been over $500USD. Books and magazines tend to ship for around $12-$15, and small packages are around $20. This can add a fair amount to the cost of what you’re already getting, so I always try and get items domestically first. I’ve not done this, but they do offer the option of waiting until you have several items to ship and then consolidating them, which in theory should save a little money. Yahoo Auctions is another place where you can score some great deals on parts. I believe you could sign up for your own account and ship to Tenso, but I find it easier to use a proxy service. Nengun provides this as well as letting you shop for non auction parts. I scored a Nardi Classic on Yahoo through them, it was in rough shape, but for $35, I could live with it. There’s also Japan Auction Center which I’ve used for buying Honda Ruckus parts a few years back, and was very pleased with the service. There’s actually a ton of these types of services, so check around. I just posted services I’ve personally used and can vouch for. Happy shopping!